Our trip to Fantastic Caverns outside of Springfield, MO was a sweet day, not unlike field trips I went on as a little girl. No matter how old or young we were, everyone on the cave tour was amazed. Sandy ended up being my junior high science teacher and I’m sure she taught us a lesson on geology and caves back then. It was fun to be students of the world together and let someone else be our guide. We rode through cavernous rooms filled with spectacular geologic wonders such as stalactites, draperies, and soda straws. I love immersive experiences. I love doing things that change the environment around me. The cave was dark, cool and damp. The air smelled both clean and sulpher-y at the same time. It was prehistoric and spooky, yet I also felt incredibly safe. It felt like we were part of some secret of the universe, tucked away deep underground in something so ancient. It was like we were temporarily planted, little seeds that were diving down underground and we would emerge subtly changed. The cool water of acceptance… I love those words so much. I’ve had my friend Francesca’s beautifully written thoughts stowed away on my phone for months waiting for the perfect time to share them. They make me think of that day in the cave with my loved ones. I know I am a grown woman, but I think I’ll always feel like a little girl with Sandy and my dad. They are my heroes, my champions - the ones who encourage me to keep growing even when it seems too dark or too deep or too hard to push up into the light. Who or what keeps you growing? Let them know! Honor them by doing your best. Cave States. Missouri is indeed a cave state. There are 6,300 recorded caves! When I googled Cave States I was filled with pride that one of my childhood best friend’s (Chris Grabau) St. Louis band came up first! I knew they would be in the search at some point, but they are at the very top! Chris is lauded as one of the most prolific songwriters in the Midwest and the band's offerings are purebred Americana. Check them out! 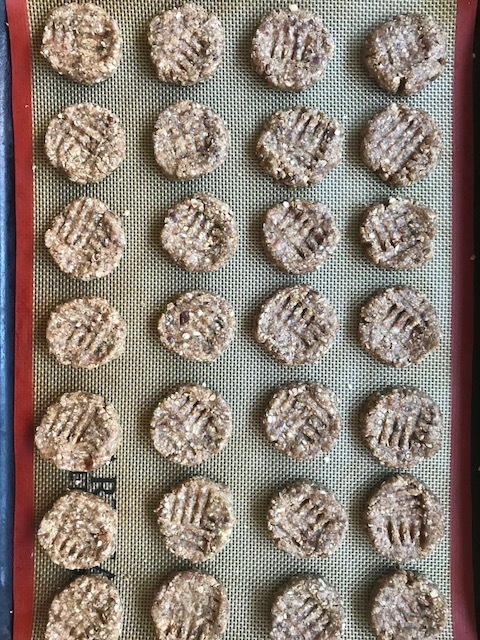 I made these Date + Seed Butter cookies last week from Sprouted Kitchen. Something about them seems a little prehistoric about them, primitive and bare bones. A perfect snack to take into a cave. I shared them with friends and called them ‘health food store cookies.’ You all know I love my sweets with straight up chocolate and sugar, but these are a great alternative with a betterforyou ingredient list than my typical sugar + eggs + butter + flour concoctions. And they're no bake! Line a plate with parchment paper. Roll the mixture into small, tablespoon-ish, sized balls. Press the centers down with the tins of a fork, cross-hatched if you wish. Refrigerate for an hour or overnight.